Q?rius Basecamp and Field. Photo, Smithsonian Institution. Built for teens, Q?rius (pronounced "curious") is a first-of-its-kind interactive and experimental environment -- part lab, part collections vault, part DIY garage, part hangout, and all fun. With Q?rius online, you don’t have to travel to Washington, DC to access the unique educational science experiences of Q?rius. Web visitors can explore science topics, collection objects, videos and activities on the Q?rius website. Obsolete and endangered sound media in the National Anthropological Archives. Photo by Donald E. Hurlbert, Smithsonian. The National Museum of Natural History received a $1 million grant from the Arcadia Fund to launch the first two years of a long-term project to digitize endangered language materials in the National Anthropological Archives, providing electronic access to thousands of source materials. Smithsonian geneticist Jesús Maldonado and his Smithsonian colleagues are among an international team of scientists investigating the physiological stress on wildlife that coexist with human settlements, livestock and agriculture. Kirk Johnson with Triceratops. Photo, Smithsonian Institution. NPR’s Joe Palca knows how to make the mysteries of science far less mysterious. 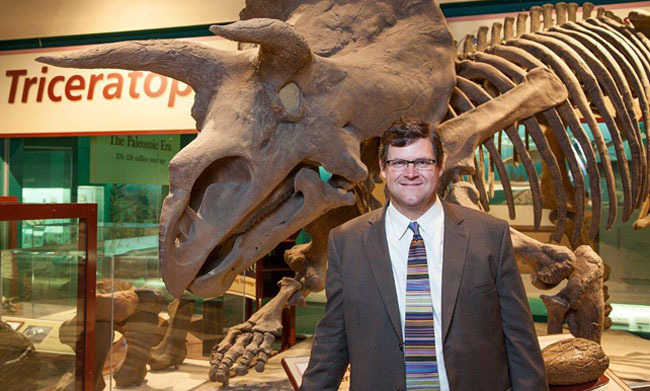 He’ll sit down with Kirk Johnson, Director of the National Museum of Natural History, for an engaging and entertaining conversation about paleontology and deep time and how it connects to our lives. To receive the member discount price for tickets to this event, log into SmithsonianAssociates.org using the Promo Code 201626 to purchase your discounted tickets. You must log in before adding tickets to your cart to view any discounted ticket prices. If you do not already have an account with SmithsonianAssociates.org, please create one. Teachers and student tour operators can reserve Q?rius for student groups, grades 6-12, to engage in 60-minute immersive programs, Monday - Friday from 10 AM - 1 PM from October through June. Fossil Whales with Nick Pyenson, Curator of Fossil Marine Mammals. Come in from the cold and take a stroll among live butterflies and tropical plants in the Butterfly Pavilion - a fee-based, live butterfly experience. Learn more > Jerusalem 3D takes you on an inspiring and eye-opening tour of one of the world's oldest and most enigmatic cities. Q?rius Youth Advisory Board members with Museum educators. Photograph, Smithsonian Institution. 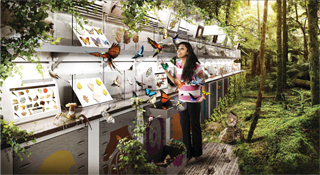 Learn about the exciting opportunities to volunteer in Q?rius, Natural History’s new state-of-the-art facility where visitors can unleash their curiosity. More > Your donation supports our free educational programs and exhibitions and contributes to ground-breaking research around the world. BANNER IMAGE: Computer Graphic Image inspired by the collection of more than 6,000 museum objects that will be available for visitors to explore and investigate in Q?rius. 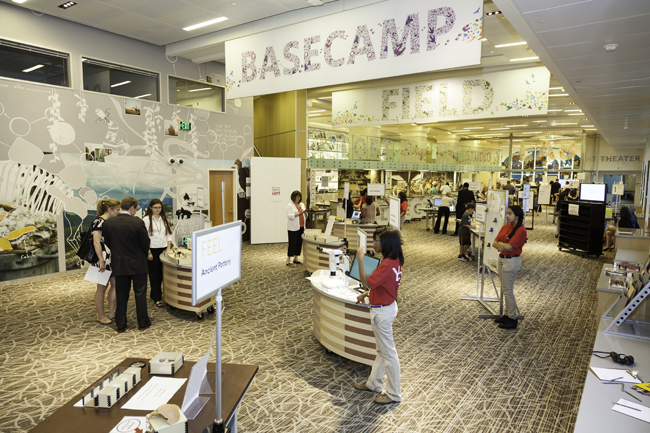 Teens will have unparalleled access to bones, minerals and fossils more than 485 million years old from the largest teaching collection in the world, as well as the same types of scientific instruments that Smithsonian researchers use in their work every day. Image credit: Smithsonian Institution.